Many professionals are waiting for their boss or mentor to provide the training, coaching, and exposure they need to advance their career. The truth is it’s up to each employee to create opportunities, gain visibility, and get the feedback they need to strengthen their performance and position themselves for future roles in the organization. It’s Your Career. Manage It! provides the specific language to use to establish candid relationships with direct supervisors, mentors, coaches, and coworkers. Employees will know what to say to get more of what they want and less of what they don’t at work. Managers and coaches will get the language and tools they need to guide direct reports and coachees into a future they’re excited about. • Start new relationships powerfully and strengthen existing relationships. • Create more trust in your office and business relationships. • Take charge of your career. • Give more feedback in a way both you and the recipient are comfortable. • Have productive coaching relationships and meetings. Get the most out of mentoring and coaching relationships. • Set expectations in new and existing relationships. • Structure mentoring and coaching relationships so they are useful and productive. • Get tools to make mentoring and coaching meetings focused and helpful. • Get more useful feedback. • Give feedback in a way that others can hear you. 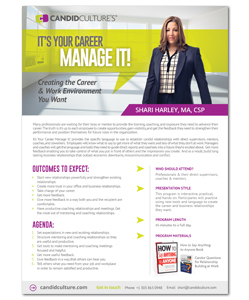 • Tell others what you need from your job and workplace in order to remain satisfied and productive. This program is interactive, practical, and hands on. Participants will practice using new tools and language to create the career and business relationships they want. Professionals & their direct supervisors, coaches & mentors. 60-minutes to a full day, depending on content.